Back Row Reviews by James Dawson: "Mission: Impossible -Rogue Nation"
Tom Cruise and Jeremy Renner prove nothing's impossible. 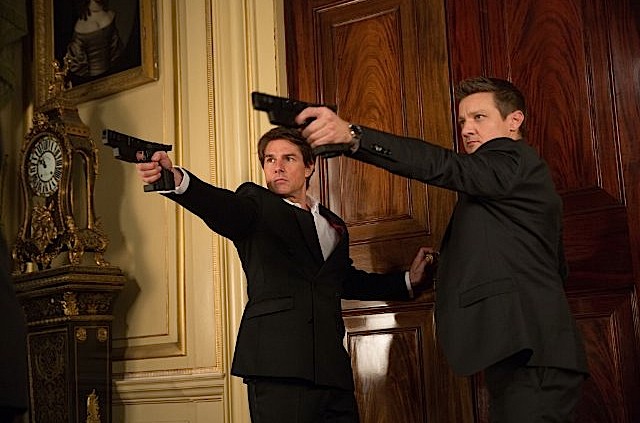 "Mission: Impossible - Rogue Nation," Tom Cruise's fifth outing as secret agent Ethan Hunt, is so much frantic, fast-paced fun that it's impossible to resist. Cruise plays the even-death-can't-stop-him Ethan with just the right amount of self amusement, determined diligence, casual competence and go-for-it gumption, always up for anything from a Moroccan motorcycle chase to a particularly deadly night at a Vienna opera house. Director Christopher McQuarrie's clever screenplay is a marvel of twists and turns that manages to be amped-up outrageous without getting too tongue in cheek about it. McQuarrie's history with Cruise includes writing 2014's excellent "Edge of Tomorrow," 2012's "Jack Reacher" and the 2008 WW2 thriller "Valkyrie." The movie opens with the much-publicized scene of Ethan hanging onto the outside of a plane as it takes off, which means that for once a film's ending hasn't been spoiled by its TV ads. Although the stunt is so memorable it would be the climax of most action flicks, McQuarrie is cocky enough to dispense with it before the opening credits, knowing there's plenty more good stuff to come. Back in Washington, indignant CIA Director Hunley (Alec Baldwin) has become so frustrated with what he regards as Ethan's recklessly dangerous off-the-books antics that he gets the Impossible Missions Force program shut down. Ethan's IMF teammates Benji Dunn (Simon Pegg) and William Brandt (Jeremy Renner) very reluctantly take CIA jobs. Ethan goes rogue and on the run, independently hunting the head of an international terrorist group called The Syndicate, aka the "anti-IMF." Rebecca Ferguson dazzles as Ilsa Faust, a gorgeous Syndicate operative who may be even more than "more than she seems." What's especially refreshing about Faust is that she's that rarest of action-adventure movie characters: an over-30 grown woman who doesn't look or act like a hormonal teenager. Like Charlize Theron in "Mad Max: Fury Road," she's also tough, resourceful and brainy enough to save the hero's life without getting all gooey about it. In one of the movie's best bits, Ethan finds himself in a seemingly no-win scenario where two assassins are simultaneously targeting a head of state, but Ethan has time to take only one shot. His solution is nothing if not ingenious. A later scene in which Ethan has to pull off an insanely difficult underwater switcheroo at a computer facility is breath-holdingly suspenseful, with a shockingly unexpected outcome. Ethan is described at one point as "the living manifestation of destiny," a hero so sure of himself that he's even willing to abduct the British Prime Minister to prove he's right. There's also a healthy amount of spycraft cynicism on display, such as when Ilsa tells Ethan, "We only think we're fighting for the right side because that's what we choose to believe." Great gadgets include a lipstick with a secret, an opera program that becomes a laptop computer and a vinyl record that does something every fan of the classic "Mission: Impossible" TV series will appreciate. McQuarrie's direction keeps things moving so quickly that the movie flies by, jaunting James Bond-style from Belarus to Austria to Morocco to London, with a few more stops in between. If the bad guys can't seem to shoot straight down even the narrowest hallways or alleys, if the old "flawlessly undetectable face mask" gag makes another appearance and if some of Benji's hacking wizardry seems highly unlikely…well, what part of "impossible" don't you understand?